Need an opinion for an upcoming purchase? Want to solve a spirited debate fueled during happy hour? The Polar iPhone app allows you to create, share, and get feedback on any subject instantly. With interface reminiscent of Pinterest, Instagram, and Twitter, the Polar iPhone app has created a slick, quick way to engage, inspire, and solve some important–or not so important problems. The efficient registration process leads you to the Polar iPhone app’s bright, strong visual presence. 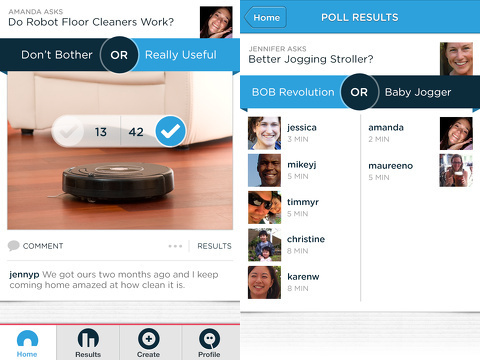 The home screen is a feed of polls with top and bottom menu bars. The top menu bar allows you to sort your feed between popular, new, and following. Each poll is visually similar to Instagram. The question and user who created the poll are at the top of each poll. The chance to select your side in the debate frames a photo that speaks to the poll. There may be one image or two. Just below the image is a synopsis of social engagement. The bottom menu bar allows you to shift between home, results, create, and profile with one touch. When you move between the selections in the bottom menu, the interface changes slightly to reflect the intention of the content. The results icon allows you to sort your polls by checking for updates, find those you created, and polls where you cast a vote. Your profile is attractive and concise. You can enhance your profile by adding a photo, your location, and a clever statement. The simple number count documenting your activity and size of your Polar iPhone app social network is similar to Twitter. Essentially, you create a poll by filling in a blank poll. You touch on the area at the top of the screen to pose your question. Then, you touch the camera or search icon to add photography. You can shoot one from within the app, use one saved in your iPhone photo library, or search for photos. You can enter one photo or split the photo area in half to accomodate two photos. The search is quick, and selections are appropriate. If you want to change your photo, you simply touch the photo and tap the delete icon. When you are complete, you share your poll with the Polar social community and your existing social networks on Twitter and Facebook. You can send in a text and email it. You can also create a link, so you can insert it into your own blog or website. 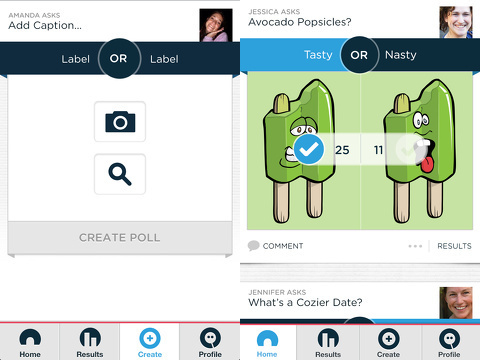 As you check out polls, you can participate and choose to follow users like Pinterest. Topics range from politics to gaming to silly to digital photography. Polar’s iPhone app is simple, fun, and visually interesting. Certainly, a Polar poll should be the highlight, but the simple, intuitive interface may be the real star. AppSafari review of Polar was written by Jenni Ward on December 14th, 2012 and categorized under App Store, Free, Polls, Social. Page viewed 4818 times, 1 so far today. Need help on using these apps? Please read the Help Page.